The four projects featured here are part of a 3-year, $1 million grant from the Rudi Schulte Research Institute. The Center also received $2.5 million gift from the Harry T. Mangurian Jr. Foundation to establish the Human Performance Innovation Initiative, which will build on existing research collaborations with the Ohio State Neurological Institute, Ohio State Athletics, and the United States Air Force Research Laboratory. Constraint-induced movement therapy (CI therapy) has been used successfully to improve range of motion in the weaker arm and also promote brain neuroplasticity, helping to strengthen the neural networks that facilitate arm movement. The Lifelogging, an integrated, whole-body network project seeks to develop an individual, holistic model of changes in neurocapacity using feedback from our nervous systems, which are constantly responding to both low-level stimuli from within our bodies and higher-level stimuli from our environments. A new study from Ohio State researchers provides evidence that exposure to dim light at night (dLAN) can lead to increased body mass, without changes in total food intake or activity. While we may not be able to eliminate light at night (LAN), we can minimize its biological effects. By becoming more aware of the impact of LAN on our brain health and physical wellness, we can make better choices about light exposure at night and how we can adapt our environments and schedule our sleep. The purpose of this pilot study is to evaluate how spinal cord stimulator implants affect the emotional, mental, and physical health of patients being treated for chronic pain from failed back surgery syndrome. Measures of pain, functionality, and disability scales, as well as patient well-being will be used to understand emotional effects of chronic pain patients. Additional metrics such as heart rate variability and sleep monitoring, as well as expression of biomarkers associated with stress and inflammation, will be assessed. This pilot study will allow evaluation of an expanded study of key inter-relationships among these indicators of brain performance. The pilot also will be used to assess the feasibility of a larger study to determine if state-of-the-art diagnostic testing will predict a patient’s eligibility for a permanent spinal cord stimulator implant after completing a trial procedure. The purpose of this study is to develop a better understanding of the physiological and cognitive profile of elite athletes. This study investigates physiological and cognitive performance metrics, as well as the expression of biomarkers of stress and inflammation, among members of the Columbus Crew Soccer Team during their training season. Understanding how physiological and cognitive metrics are vary with during competition can be utilized to enhance training, mitigate injury, and optimize performance and recovery. Spinal Cord Injury (SCI) associated infections affect patient outcomes by impairing neurological recovery and increasing rates of disability and mortality. This study aims to identify factors that increase risk of infection after SCI. The ability to predict infections will allow for personalized treatment to reduce mortality and protect neurological outcome. Heart Rate Variability (HRV) will be used to assess autonomic shift, which may predict infection earlier than it is possible to obtain with blood sample measures of infection. Although traumatic brain injuries can cause permanent cognitive impairments, it was previously believed that these impairments were static after the initial recovery phase plateaued; however, evidence now indicates that health status following TBI is more dynamic than once thought. This longitudinal study seeks to characterize physiological markers that may predict future decline in patients who have experienced moderate-severe TBI. The ability to identify precursors to decline will allow for personalized targeted interventions in the future. Hypersomnia is a condition in which a person has difficulty staying awake and alert during the day, despite adequate nighttime sleep. The purpose of this study is to assess the effect of transcranial direct current stimulation (tCDS) on sleepiness and alertness in patients with hypersomnia. In this randomized study, measures of alertness and sleepiness among participants receiving tCDS will be compared to participants receiving sham intervention. Results from this study will be used to inform clinical management of hypersomnia. Obstructive Sleep Apnea (OSA) is associated with a variety of adverse consequences including hypertension, stroke, cardiovascular disease, and motor vehicle crashes due to excessive daytime sleepiness. This biorepository will compile demographic data, survey responses, medical history, and biomarker data from patients with OSA undergoing sleep studies. Knowledge about the risk factors, physiological, biological, and genetic differences as well as outcomes obtained from a cohort of subjects undergoing sleep studies will inform our understanding of the relationship between sleep and brain performance, as well as improve clinical treatment of patients with OSA. In athletic and military populations, physical exertion or exercise stress plays a major role in the demands placed on athletes and warfighters. This study, done in cooperation with the Air Force Research Laboratory, seeks to examine how float tank therapy affects recovery following physical exertion. Markers associated with performance and recovery will be compared between participants receiving float tank therapy and participants who rested under normal conditions. Cognitive testing and biomarkers associated with traumatic brain injuries will also be assessed, with the ultimate goal of understanding how to augment restorative processes, which can also be applied to clinical populations. Preliminary data has shown that brain activities can be evoked by external stimuli. This study seeks to create a mathematical model utilizing cognitive, physiological, and behavioral measures of brain performance, in addition to biomarkers, in order to control a robotic helmet. This helmet will assist in relieving symptoms associated with brain neuron degenerative diseases, such as Alzheimer’s disease. 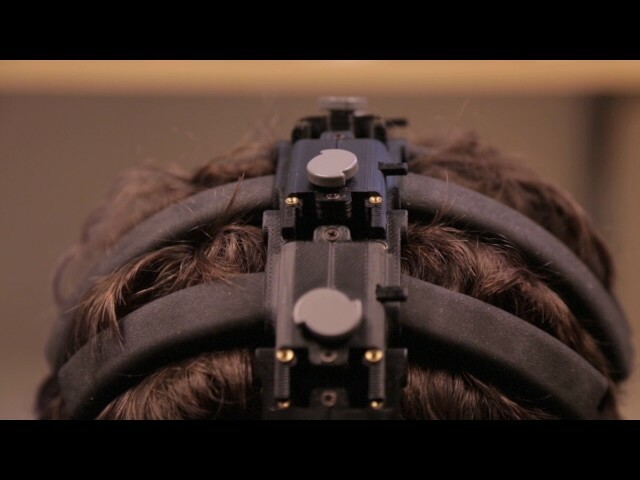 The helmet will be used for non-invasive interactions of brain cellular activities. The helmet will utilize infrared lasers, tactile stimulation, and sound, with this stimulation manipulated based on EEG-feedback. If successful, this project will serve as a platform to validate ideas for managing the symptoms of Alzheimer’s Disease using noninvasive mechanical, electrical and acoustic means. Injuries, both musculoskeletal (MSK) and concussive, are widely prevalent in athletes, military members, and the general public. Data from a pilot study shows accelerated recovery from concussions and MKSs using floatation therapy. Additionally, flotation therapy and photobiomodulation therapy have been shown to reduce stress and pain, which in turn should reduce overall inflammation. This project, being completed in partnership with the Air Force Research Laboratory, will utilize floatation tanks and photobiomodulation devices for athletes at The Ohio State University. Heart rate variability will be used to assess athlete recovery. Data for return-to-play metrics for concussions and MSKs at Ohio State, the Navy, and the Air Force will be compared to the athlete groups undergoing flotation therapy, with the overall goal to assess the ability to accelerate recovery from injury and track progress through monitoring of autonomic function. This project is being completed in partnership with the Air Force Research Laboratory, with the goal of analyzing historical data collected by the OSU Athletic Department, as well as building and launching the custom Fusion Sport Smartabase platform. Analysis of existing data can give insight into injury history, return to play and other performance metrics, which in turn can be applied to clinical populations to facilitate more efficient and effective recovery methods. The new Smartabase provides flexibility to import, analyze, and visualize multiple types of data. NeuroCapacity refers to our moment-to-moment capacity for performance. This study will track daily activities over the course of 100 days with a non-intrusive device that takes photos and saves GPS location. Additionally, the study will collect physiological data, assess cognitive function and evaluate mental states associated with randomly sampled daily tasks. These data will be combined with EEG and fMRI sessions in order to relate resting and task-based performance to neural measures, which in turn will be used to predict changes in NeuroCapacity. Previous studies have implicated exposure to light at night (LAN), particularly blue light (e.g., TV and smartphone screens), may drive depression and obesity by causing neuroinflammation. This study seeks to study the effect of dim LAN on inflammation in diurnal rodents, and human populations. Sleep timing and sleep quality, as well as biomarkers associated with inflammation, will be assessed in both rodents and humans. The effect of red light on these metrics will also be analyzed, because unlike blue light, red light minimally affects the photoreceptor that synchronizes circadian clocks to the environment. This study will help to determine whether LAN contributes to the growing number of people with sleep disorders in the US. Upper extremity motor impairment is present in more than 50% of individuals with multiple sclerosis (MS), typically with one arm noticeably weaker than the other. Constraint-induced movement therapy (CI therapy) has been shown to enhance a person’s ability to perform activities of daily living; however, this treatment is unavailable to many who would benefit because extensive hours of intervention must be provided by a trained physical or occupational therapist. In order to address this barrier, a computer gaming rehabilitation program utilizing the concepts of CI therapy was developed. Game play is driven by hand and arm movement that is detected by a Microsoft Kinect camera. A randomized controlled clinical trial will assess the feasibility and initial efficacy of this new treatment for arm weakness in progressive MS. Funding from the Rudi Schulte Research Institute extends the study to identify kinesthetic biomarkers of cognitive and motor fatigue.